With all of this hot weather, one could really go for some Italian Ice! Luckily, Rita's Italian Ice is gluten free! In addition to being gluten free, they are also a great fat free and cholesterol free snack. Rita's Italian Ice is also kosher certified! 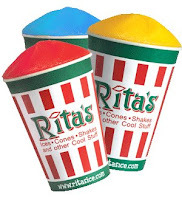 Rita's stores are located throughout Alabama, Connecticut, District of Columbia, Delaware, Florida, Georgia, Massachusetts, Maryland, North Carolina, New Jersey, New York, Ohio, Pennsylvania, Rhode Island, South Carolina, Tennessee, Texas, Virginia, and West Virginia. For more information, please visit their website at www.ritasice.com. Ener-G Foods is a brand of gluten free products that have been around for quite some time. I'm sure everyone is familiar with seeing them at their local health food store! In addition to offering a wide selection of gluten free and dairy free products they also offer an assortment of products for those on low protein diets! In addition to the above, Ener-G Foods' products are also free of peanuts, tree nuts and are kosher certified. Their bakery is completely dedicated to gluten free baking! Ener-G Foods are available in the United States, Europe, Canada, Latin America, and Asia and at most health food stores! You may also purchase their products at Ms. Celiac's Market. For more information, visit their website at www.ener-g.com! 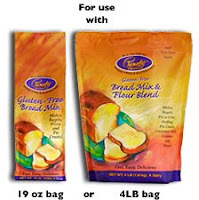 Pamela's Products were kind enough to send me a bag of their gluten free Cornbread & Muffin Mix recently. This weekend, I decided to give it a try and bake some corn muffins! I was amazed by how easy and quick the recipe was. All I needed in addition to the mix were eggs, sugar, and oil (or butter). I mixed everything together and then poured the batter into my muffin pan and cooked for approximately 15 minutes. The bag made 12 muffins! I tried one last night after my baking and it was delicious! They tasted just as I remember corn muffins that were not gluten free to taste! Pamela's Products are available at many health food stores. For more information on where you can purchase their products, please visit www.pamelasproducts.com. 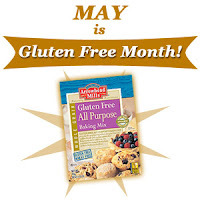 You may also purchase the Gluten Free Cornbread and Muffin Mix at Ms. Celiac's Market by clicking here! Several of Pamela's Products are available at Ms. Celiac's Market. So, check it out! I just wanted to remind you about Ms. Celiac's Market and all of the delicious gluten free products we sell! Since the market opened, we have added an assortment of great gluten free brands for you to choose from! Ms. Celiac's Market sells everything from books to baking mixes to breads to chips to drinks to treats! 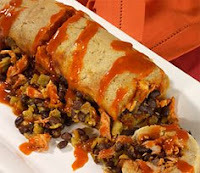 Please check us out by visiting, Ms. Celiac's Market! First of all, I wanted to thank everyone for all of the kind comments that are being sent my way! Ms. Celiac Says... has grown so much from when it first started back in January 2009 and it continues to keep growing! Coming the 1st week of June, I will hold a week long feature of the gluten free restaurants and stores of Long Island, New York. Due to the holiday weekend, there will be no posts until Tuesday, May 26th. So, have a good, gluten free Memorial Day weekend! Last night, I decided to check out a new vegan ice cream place in my neighborhood, the East Village, after finding out that their ice cream is also gluten free! I ordered a cup of chocolate coconut ice cream and I was in heaven! The ice cream tasted like gelato and did not taste dairy-free at all! As I waited for my ice cream to be scooped, my eyes glanced into a case of cupcakes. I almost fell over when I noticed the sign that said "gluten free." Then I realized that the cupcakes were from Babycakes, a vegan bakery further downtown that also makes some gluten free products. In addition to both vanilla and chocolate and red velvet gluten free cupcakes they also had a gluten free brownie and a selection of gluten free cookies! Stogo is a gourmet organic dairy-free ice cream parlor at 159 2nd Avenue (entrance on East 10th St. btw. 2nd and 3rd Aves). Their ice cream contains no refined sugars, no animal products, no preservatives, and no artificial flavorings! For more information, please visit stogonyc.com! One of the 1st brands I came into contact with when starting the gluten free diet, was Arrowhead Mills. They produce a wide selection of gluten free products from baking and dessert mixes to flours to beans to grains to seeds to rice to nut butters to cereals! Arrowhead Mills uses no genetically engineered ingredients and no preservatives. My favorite Arrowhead Mills cereal is their Maple Buckwheat Flakes. That is actually my favorite gluten free cereal overall! Arrowhead Mills products are available at most natural food stores. You may also purchase them at Ms. Celiac's Market. For more information, please visit www.arrowheadmills.com. 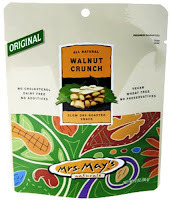 If you are in the mood for a healthy snack, why not try Mrs. May's Naturals? All of Mrs. May's products are vegan, non-GMO, cholesterol free, dairy free, wheat free, gluten free, and contain zero trans fats and no artificial colors or flavors! Mrs. May's Naturals are available throughout the United States at Costco, Smart & Final, Marukai, BJ's Wholesale Club, Hannaford, Metropolitan Market, and other select health food stores. Mrs. May's Naturals are also available at select retailers in Canada, Mexico, Korea, Japan, the Philippines, Australia, and the UK. For more information, please visit www.mrsmays.com. To purchase Mrs. May's Naturals, visit Ms. Celiac's Market. 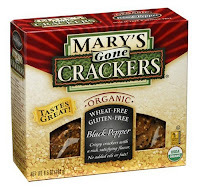 If you are looking to try a nice, tasty, flavorful cracker, you must try Mary's Gone Crackers. Their signature product is a cracker made with organic brown rice, organic quinoa, organic flax seeds and organic sesame seeds. They also sell Mary's Gone Crackers Crumbs and Sticks & Twigs. All of their products are gluten free! In addition to being gluten free, their products are organic, vegan, and certified kosher. They are made in a dedicated nut free and gluten free facility. The crackers are available in 5 flavors including original, caraway, herb, black pepper, and onion. The crumbs come in original, caraway, and savory blend. The sticks & twigs come in Chipotle Tomato, Sea Salt, and Curry. Mary's Gone Crackers products are available at a variety of health food stores. 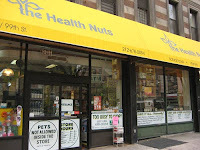 In NYC, you can find them at Whole Foods, Fairway, Health Nuts, Westerly Health Foods and many other health food stores. You may also purchase them at Ms. Celiac's Market. Enjoy Life products are 20% off until May 31st at Ms. Celiac's Shop on Amazon Marketplace. Just enter the code ENJOYLIF at checkout! And if you spend over $25, you will also get FREE SHIPPING. There will be no usual post today as I've been preoccupied this week taking care of my new puppy (a toy poodle). However, I did want to remind everyone that this month, May, is Celiac Disease Awareness Month. I hope all of you are doing your part to spread the word about this under-diagnosed condition. So, I'm not really a fan of fast food, but sometimes you're in a place where that is the only option. Thankfully, there are several fast food restaurants that offer gluten free choices! These include: In-N-Out Burger, Burger King, Wendy's, and Subway. 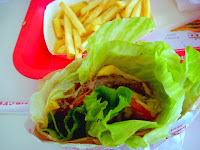 In-N-Out Burger has several locations on the west coast. If you are on a gluten free diet you can order a 100% beef burger "protein style" and it will come wrapped in a lettuce leaf. Their french fries are made from real potatoes and are fried in 100% cottonseed oil with no risk of cross-contamination. The spread they use on the burger is gluten free and dairy free too! For more information, visit In-N-Out Burger. Burger King's french fries are made in a dedicated fryer and do not contain gluten. The apple fries are also gluten free, as are the plain beef patties. For more information, visit Burger King. At Wendy's you can order a hamburger patty, a grilled chicken breast, a baked potato with several of the toppings, chicken caesar salad without croutons, southwest taco salad, and some other items. For more information, please visit Wendy's. Subway has a huge selection of gluten free salads and meats (too many to list). For more information, visit Subway. Sarah's favorite restaurant is the Brown Bottle in Cedar Falls, Iowa. It is an Italian restaurant with a gluten free menu. For more information, please visit the Brown Bottle. Sarah's favorite product is Bob's Red Mill White Rice Flour. Ashley's Favorite restaurant is Pete's New Haven Style Apizza in Washington, DC. For more information, please visit Pete's Apizza. ~If you didn't win this time, there will be many more future contests to enter! A while ago I mentioned that Betty Crocker would be coming out with a line of gluten free baking mixes. Well, they have finally updated their website with more information! The ingredients are made in a Gluten Free Processing Facility and are also certified kosher. These dessert mixes will be hitting shelves at traditional grocery stores this June! By Fall 2009, all flavors of Betty Crocker's Ready-to-Spread Frosting will be labeled "gluten free." Celiac Specialties is a 100% gluten free and now nut free bakery located in Michigan. They sell a variety of delicious products ranging from breads to brownies to cookies to donuts. In addition to being gluten free, some of their products are casein free. And if you don't live near Michigan, Celiac Specialties Gluten Free Bakery products are available at retail locations in Colorado, Illinois, Indiana, Kentucky, Massachusetts, New Jersey, New York, Ohio, Pennsylvania, and Rhode Island. 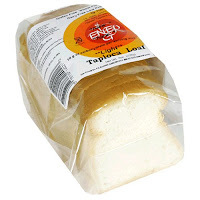 You may also order their products online at www.celiacspecialtiesshop.com. Shipping is available to all 50 states and parts of Canada. The Bakery On Main products are produced in a plant that is certified Kosher by the Orthodox Union and is certified for organic production. Their granola is 100% natural and has no artificial flavors or trans-fats and no refined sugars. Bakery On Main products are available in AL, AR AZ, CA, CO, CT, DE, FL, GA, IA, ID, IL, IN, KS, MA, MD, ME, MI, MN, MO, NC, NE, NH, NJ, NM, NY, OH, OK, OR, PA, RI, SC, SD, TN, TX, UT, VA, VT, WA, Washington DC, WI, WV, and WY. A Matter of Health Inc. When I attended the Suffolk County Gluten Free Vendor Fair, I learned about a brand of gluten free chocolates that I had never heard of before. 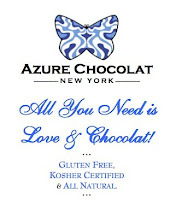 The brand is called, Azure Chocolat and they make gluten free, kosher, and all natural chocolates. At the fair, they were handing out samples which were delicious and I decided to buy a S'more- absolutely delicious! Azure Chocolats can be shipped to anywhere in the United States. They also have a store located in Centerport, New York. For more information, visit their website at http://www.azurechocolat.com/ or call 1-631-425-1885. 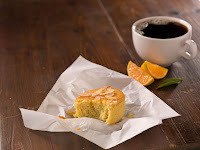 Have you tried Starbucks Gluten-Free Orange Valencia Cake? If not, I suggest you run to the nearest Starbucks (no excuses - there is one on every corner) and try it now! Of course, the first thing that I did yesterday morning was go to my local Starbucks in search of this new product. There it was sitting by itself on a raised tray with a sign that read, Gluten- Free Orange Valencia Cake. With the exception of the display cake, the others were all sealed in plastic wrap to protect them from cross-contamination! I must say I've been waiting for Starbucks to release gluten free products ever since they teased the NYC market with gluten free brownies two years ago and promised to sell gluten free products in the near future. However, I would have preferred if they released a product that was more mainstream (in my opinion, at least) like something containing chocolate (my favorite! ), as I'm not a huge fan of oranges with the exception of in juice form. That being said, I really did enjoy the Orange Valencia Cake. Thankfully, the orange flavor was subtle and not overwhelming. The cake was sweet and moist and soft and much larger than I expected. One was definitely filling enough for my breakfast. The nutritious value of this gluten free treat has its pluses and minuses. On the plus side, it contains 9 grams of protein and 30% your daily value of Vitamin C. On the minus side, it contains 290 calories, 16 grams of fat and 23 grams of sugar. Starbucks Gluten-Free Orange Valencia Cake retails for $1.95 throughout the United States with the exception of Hawaii where it sells for $2.25. Also, she will be discussing and signing the book at Borders Park Avenue in NYC on Thursday, May 7th at 7 PM! For those of you that don't know, the month of May is National Celiac Awareness Month, and this May we have so many great things going on for us in the Celiac community! Today Elisabeth Hasselbeck's book, The G Free Diet, was released! I hope you picked up your copy! Don't forget, she will be discussing the book and signing copies at Borders Park Avenue in NYC on Thursday, May 7th at 7 PM. Also, she has launched a website for the book and you can visit it at www.gfreediet.com. Also, tomorrow Starbucks will debut it's first gluten free product nationwide, the Orange Valencia Cake. So, make sure to check-out your local Starbucks and try this new treat! One of the newest gluten free products that I have been addicted to lately are from Applegate Farms! Recently, they released their Natural Gluten-Free Chicken Nuggets. These chicken nuggets are breaded with a combination of rice and corn flour and are absolutely addicting. I've enjoyed them with ketchup or plain and both ways they are still good! And the awesome thing about them is that they come fully cooked. In the microwave, they only take 1 minute and 30 seconds to heat. So, if you are in a rush to make dinner this is definitely a great option! Applegate Farms Natural Gluten-Free Chicken Nuggets are available in the freezer section of your supermarket or health food store. In addition to being gluten free they are also dairy and casein free. For more information, please visit www.applegatefarms.com. THE G FREE DIET By Elisabeth Hasselbeck is released today! Go out and buy your copy now! Today between 12 noon and 4 PM, Red Mango will be giving out free cups of its newest flavor, Tangomonium. Even better, it's gluten free! Go get some! Mr. Ritt's Has Ridiculously Good Gluten Free Food! One of my favorite brands that has been at the Suffolk County Gluten Free Vendor Fair for the past 3 years is Mr. Ritt's Gluten Free Bakery. The store used to be based in Pennsylvania but is now located in Millville, New Jersey and is open from Thursday - Sunday. Mr. Ritt's Gluten Free Bakery sells an assortment of delicious gluten free products ranging from breads to pizza crusts to cakes to cupcakes. Mr. Ritt's Gluten Free Bakery products are available in select health food stores in New Jersey, Iowa, Rhode Island, Ohio, Pennsylvania, and New York. You may also order his products by calling 1-877-MR-RITTS (677-4887). However, not all products are available for shipment. Soon you will be able to order his products online at www.mrritts.com.